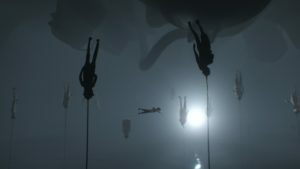 I’ve been seeing Inside mentioned a lot lately, chiefly in two ways: “This looks a lot like Limbo” and “Oh my god the final level”. The general reluctance to elaborate on the latter sentiment got me curious enough to try it for myself. I won’t spoil the final level (even as I show no such restraint for the rest of the game), but I’ll elaborate a little. It’s audacious. It’s unexpected, but it doesn’t come out of nowhere. And it’s gross, but in a way that’s more funny than than anything else, which comes as a relief after the tension and creepiness that dominates the rest of the levels. This change in tone is part of what makes it audacious, and probably part of why it’s provoked such strong reactions. As for the resemblance to Limbo, the first thing I have to say is that it’s not alone. Limbo seems to have inspired an entire genre of grayscale puzzle-platformers. Inside at least has the excuse of being by the same developers as Limbo, and it uses the formula as a launching-point, not a constraint. For one thing, it’s not really grayscale. It’s just highly desaturated, and it seems like the desaturation is mostly a way to represent dim lighting. Whevener a really bright light hits the player character, you see just how vividly red his shirt really is. The opening of Inside is surely meant to remind us of Limbo, starting as it does with a boy alone in a dark forest, with not a word of explanation. But as the game went on, I kept encountering scenes that reminded me more of other games: Canabalt, Another World, Heart of Darkness, even Oddworld: Abe’s Oddysee at one point. They key difference is story. Limbo has about as much story as your average dream. It’s all about mood, not narrative, and scenes flow into each other without a lot of logic. Inside quickly makes a promise of greater coherence by grounding itself in the realistic: at the point in Limbo where you start encountering giant spiders, Inside instead gives us a couple of grownups with flashlights standing next to a large truck. On seeing them, the PC shifts unbidden into stealth mode — there’s no manual stealth toggle in this game, just automatic variations in posture and movement that indicate to the player what sort of scene we’re in — and we understand that we’re being hunted. That is effective storytelling. There are no words in this game. The story is told mainly through environment. You tumble down a highway embankment and escape to an abandoned farmyard, where you see dead pigs piled up — some sort of disease? Is that why they’re hunting me, because I’ve broken quarantine? Then a seemingly-dead pig stands up and attacks you: Oh no, is this a zombie apocalypse story? Well, there are zombies of a sort, it turns out, but they’re not Romero-style killer ghouls. Rather, they’re the sort that’s passive unless controlled. One of the game’s more striking images comes when the trucks from the beginning unload a cargo of zombies, presumably collected by those men with flashlights. Unloaded, the zombies form orderly queues and march into a compound of some sort, clearly receiving signals from some unseen source. The brilliant part of this is that at certain points you can find the machines that control the zombies, consisting of a sort of glowing helmet connected to a device with an antenna, and use them yourself. You may be working against the people doing this, at least to the extent that they’re trying to capture you and you’re trying to not be captured, but that doesn’t prevent you from using their tools to your advantage. There’s even a bit where you daisy-chain it by making a zombie put on a second helmet, effectively acting as a repeater to reach a zombie that’s out of your range. Through this, I kept thinking: This is about the player/character relationship. The boy controls the zombies in a similar way to how I control the boy. In a sense, the daisy-chaining of control was already happening. Things keep getting more science-fictional as the story ramps up, with the appearance of large possibly-alien machines, but the full story of what’s going on never becomes completely clear. In a guarded complex, we see a roomful of zombies floating upside-down underwater, their heads hooked up to zombie-control helmets. Why? To strengthen a signal, maybe? Is the large spherical device at the heart of it all something that the technicians built, or something that they found and are studying? I do have a sense that, unlike in Limbo, the developers have definite answers in mind, and that I could possibly figure it out if I paid enough attention to details. But simply playing through the game is not enough to fully understand it. Maybe it really is chiefly about mood after all, with just an illusion of story to provoke that mood. OK, I finally convinced myself that the last Battleships puzzle really is impossible, and gave up on it. This decision hinged on the realization that the puzzle could be wrong without any errors in the row and column numbers. 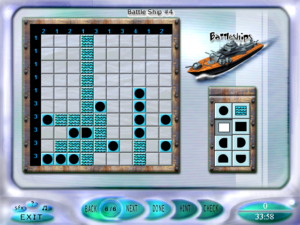 See, most Battleships puzzles start off with at least one tile already filled in, either with a ship piece or empty water, to eliminate ambiguity and guarantee unique solutions. (Annoyingly, the game lets you delete the pre-set tiles just like any tiles you’ve placed yourself, so you have to remember where they are so you don’t do that. The print version doesn’t have this problem.) This puzzle had one pre-set tile, a right-side endcap for a ship. When the game revealed the correct solution, sure enough: that endcap had been placed one space away from where it should have been. In retrospect, it’s a miracle that there weren’t more mistakes like this throughout the logic puzzles, given how many there are elsewhere. The remainder of the game went quickly. 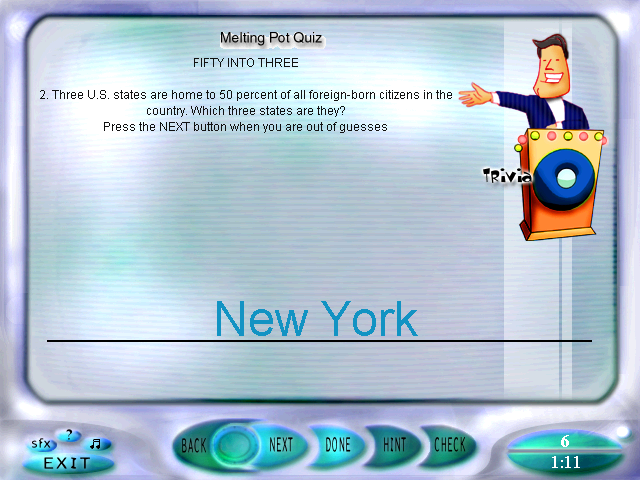 I finished the rest of the Trivia section, discovering as I did that one entire set of trivia questions had been accidentally put in twice under different names, then blasted through the Visual section in a sitting. Mainly it’s more of the visual puzzle types from the first game, this time with color added. 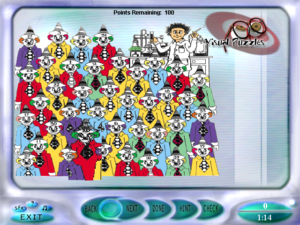 In one case, the added color actually interferes with the puzzle: you’re asked to identify the one clown in a clown crowd that doesn’t match any of the others, and the clowns were colored without regard to whether they were supposed to match or not. But then, the scan was bad enough that it was more or less ruined anyway. 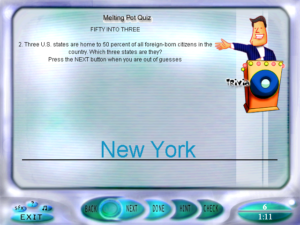 There’s a whole lot of puzzles where you have to type in phrases clued by cartoon images, and I’ll note that the typing interface here doesn’t have the problems it did in the Trivia section. There’s three of the sort where you have a line drawing overlaid on a grid, and have to find squares in the picture that match a set of clue squares. This was never all that hard a puzzle type, but the addition of color makes it downright trivial. Also, in the first game, I noticed that the clue squares, which were supposed to be in random orientations, were all in the same random orientation. It seems like they didn’t fix that. Probably they didn’t even notice it. There’s one Cross Comics puzzle, where you have to arrange a bunch of comic panels into crossing but independent strips, like in Scott McCloud’s Choose Your Own Carl. The first game had one of these as well, although I didn’t describe it before. The UI for it there was terrible, and here it’s slightly less terrible — it’s a little easier to select panels — but still terrible in fundamentally the same ways. The basic problem is that the panels are displayed at a size that’s illegible at the game’s resolution. When you select a panel, a blown-up version is displayed on the right so you can actually read it. However, once you’ve selected a panel, you have to place it in the grid. You can’t even click on another unplaced panel to change your selection until you’ve placed the one you’ve selected. So you can’t read all the panels in advance, and it’s hard to check what you’ve already placed without accidentally rearranging it. Also, there’s one panel already placed, and you can’t select that one, which means you can’t read it. I can think of a simple change that would solve all of this: displaying the blow-up on rollover instead of click. That done, all that remained was the final puzzle. I may well be the only person in the world to see it, other than the developers. The main menu displays your options as green circles, and has one spot that looks like an empty depression where a green circle belongs. I had been assuming that this was where the button to access the final puzzle would appear when it was unlocked, but no. Instead, the final puzzle comes up automatically when you unlock it, and also every time you try to play any of the puzzles afterward. That’s right, unlocking the final puzzle locks you out of everything else. I can see a little sense to this: it’s a metapuzzle that’s intended to test your memory of the other puzzles. But you still can’t access the other puzzles after you’ve solved it, except by making a new profile. 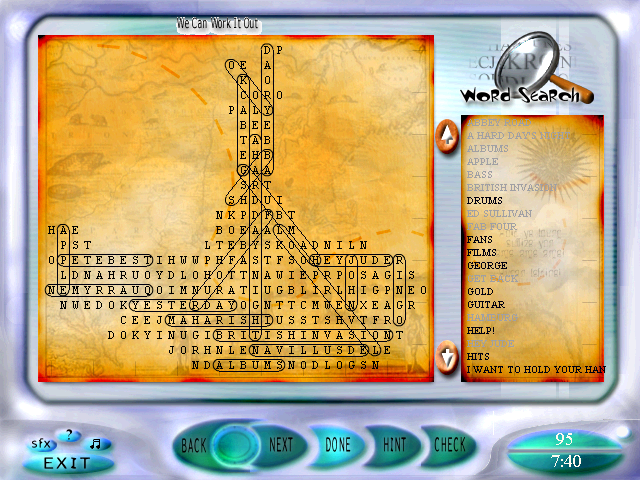 The way it works is: At the top of the screen, you get a bunch of pictures from the other puzzles in the game. The first letters of the names of those puzzles form the key to a cryptogram. Again this shows the designers’ ignorance of what they were making. 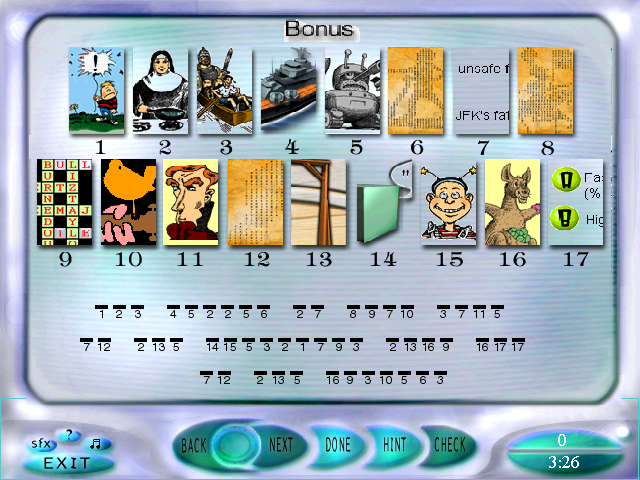 To get to this point, the player has been through an entire section of cryptograms far harder than this one. The key is unnecessary. When you solve the cryptogram, and enter the correct answer, the game will tell you that it’s wrong. This is because their solution has the word “then” where it should have “than”. “Then” doesn’t even fit their own key. This is pretty much the perfect ending to the game, if you ask me. Just one last really obvious boneheaded mistake before saying goodbye. It still hasn’t fully sunk in that it’s all finally over. This game is going to haunt me for a while. I knew before starting my posts that the the two games were buggy, but I didn’t realize just how bad it was going to be. But it feels good to have a record of it all. Perhaps it can serve as a warning. There are really two opposite ways to be stuck on a logic puzzle. The more usual way is to be unable to eliminate possibilities, so that the number of solutions under consideration is too large to simply iterate through. The other way is to eliminate all the possibilities. If you can do that, and the puzzle actually does have a solution, it means there’s an error in your reasoning somewhere, a variation that you’re forgetting about. But knowing that there’s an error doesn’t help much in finding it. That’s the position I’m in with the last Battleships puzzle. There’s one four-long ship in every puzzle, and this puzzle has only one row or column that can hold it. Since the grid is 10×10, that means there are only seven positions this ship can go in. And I can prove every single one impossible. There must be a mistake. That much is clear. But is the mistake mine or theirs? I actually think it’s probably mine in this instance. Battleships has a certain amount of error-detection built in. There are exactly 20 tiles worth of ships in every grid, so you can tell if there’s a mistake in one of the row or column numbers by adding them all up and seeing if you get 20. This would fail if there are two or more errors that cancel each other out perfectly, but how likely is that? So I think I’ll have to keep on looking for a solution here. 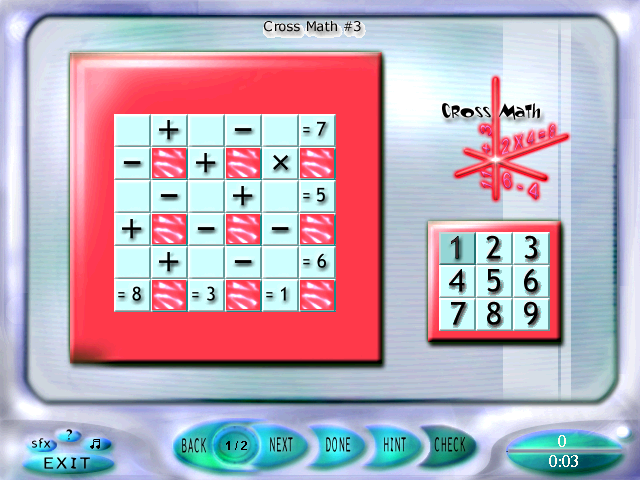 I can’t say the same for the last remaining Cross Math puzzle. Here, a similar summing technique proved that the puzzle is wrong. In these puzzles, you have to fill the numbers 1 through 9 in such a way to satisfy all six horizontal and vertical equations. Now, observe that the horizontal equations in this one have no multiplication or division. If they had nothing but addition, then the sum of all three rows would have to add up to the sum of all the numbers from 1 through 9, which is to say, 45. But some of the numbers are subtracted. The effect of subtracting a number instead of adding it is to subtract that number from the total sum twice: once for removing it as an addend, and once for the actual subtraction. So no matter what numbers have their signs flipped, the result will differ from 45 by an even number. The sum of all three rows therefore has to be odd. But this puzzle gives us rows that sum to 18. Having thus convinced myself that at least one of the sums here was wrong, I told the game that I was done with the puzzle, and was pleased to be vindicated: in the game’s solution, the top row makes 8, not the 7 claimed. Proving a puzzle incorrect in this way is a sort of metapuzzle, and at least as satisfying as solving the puzzle itself. To counteract this, I’ve moved on to the Trivia section for a bit. It turns out to be annoying — enough so that I didn’t finish it in one sitting like I had planned, even though it’s half the size of the other sections. Partly this is due to the design. You may have noticed from my screenshots that every puzzle type in Games Interactive 2 has its own logo, with a picture labeled in a zany font. Usually this is something you can ignore, but for Trivia, they animated it and made it part of the game. The picture is a caricature of a game show host, which makes sense, I suppose, but honestly isn’t the feel I’d have gone for. He wiggles his head back and forth while waiting. His facial expression changes with your guesses. When you get something wrong, a buzzer sounds and the light on his podium turns red; when you get something right, a brief latin-rhythmed victory ditty plays. If you have sound turned on, you hear this enough for it to become irritating. If you don’t, you just get a pointless pause for a few seconds before it goes on to the next question. But the worst part of the Trivia section is the questions where you have to type in an answer. This isn’t always the case — most of the questions are multiple choice. But some are type-ins, and a lot of them aren’t really designed for this game. For example, at one point it asks you for the two ways, other than Lisa’s saxophone tune, that the opening credits sequence from The Simpsons varies from episode to episode. Nobody is going to get that one right, because nobody, even if they know the answers, is going to phrase it in exactly the ways that the computer is checking for. But let that slide for the moment; a lot of the questions are reasonably answerable. The more consistently annoying problem is that the game isn’t very responsive to typing. You pretty much have to hold keys down for half a second or so to make sure they register. This is basically intolerable, and I don’t remember the first Games Interactive having this problem. Games Interactive 2: The Benefits of Carelessness? Among their many other flaws, the two Gameses Interactive are lopsided. There’s a good variety of different puzzle types, but if you want to play ’em all, you’re going to spend the bulk of your time on the Battleships and Paint By Numbers, as my posts here will attest. It’s like one of those Mixed Nuts assortments that’s mostly peanuts. I feel like it’s gotten worse in Games Interactive 2, too. It definitely has in one respect: it has six Paint by Number sets where the first game had only four. But it seems to me that the Battleships have gotten harder. I said in my first post about Battleships that it took me about an hour to complete a set. I think that was an understatement, but now, I’m wishing that a set of Battleships took me so little time. 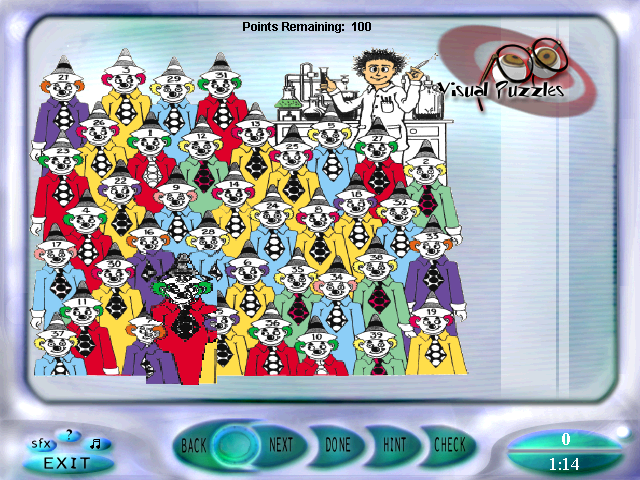 I think there are some individual puzzles that take me that long. I don’t have exact numbers, though, because the in-game clock maxes out at 99:59. The thing is, though, I could well be wrong. That is, even if the puzzles are taking me longer, it doesn’t necessarily mean that they’re actually more difficult. It must be remembered that back in the first game, I got a number of the Battleships puzzles wrong. By now, I’ve learned from experience how to quickly and accurately check the correctness of a solution. I start by checking the ship counts — one four, two threes, three twos, four ones. It gets so you can do this at a glance. Then a sweep over the numbers in each row and column, and finally make sure that none of the ships are touching at their corners. Thanks to my thoroughness, I haven’t submitted an incorrect solution in a long time. But it takes a lot more time to find a correct solution than a solution that’s almost correct and fails in just one respect that you failed to notice before submitting. And the almost-correct solution is just as useful for completing the game, by both my personal criteria, which basically just consist of “Submit solutions in good faith”, and those required for unlocking the final puzzle in Games Interactive 2, which don’t even require that. Unexpectedly, I seem to have found a new technique for use in Paint by Numbers: eliminating possible positions for a run along an edge (either the natural edge of the grid, or any line past which you’ve eliminated any possibility of occupied squares) by considering how the perpendiculars affect the next tiers inward. For example, suppose the leftmost column in the grid says just “7”, and the column adjacent to it says “5”. It follows that the run of 7 must either have no rows in common with the 5, in which case it coincides with seven rows that start with 1, or have enough rows that begin with something other than 1 to accommodate the 5. That is, if you have seven rows that start with 1 except for one in the middle that starts with 2, that can’t be where the 7 goes, because it would place an isolated square into the second column where it can’t be part of the 5. It’s obvious when you think about it. (If it doesn’t seem obvious from my description, my description is to blame. It would probably be clearer from an illustration.) But it’s a thing that’s easy to not think about, especially if you’re plugging away at the more usual techniques. The only thing that made me start thinking about it in this way was a sequence of puzzles that pretty much relied on this sort of reasoning, having lots of one-thick outlines around the edges. I understand that popular logic puzzles, like nonograms and sudoku, have names for specific techniques. I don’t know the names, though, because I haven’t studied the theory. To me, finding the techniques yourself is part of the fun. Which I suppose marks me as a programmer. 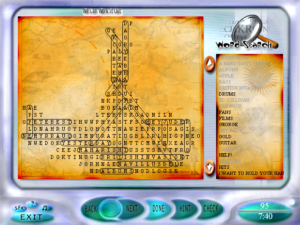 While I’ve been stuck on the Battleships, I’ve been progressing through the Word Puzzles. I finished them today. I haven’t been posting about them because I don’t have much to say about them. It’s exactly the same assortment as in the first Games Interactive: Bulls Eye, Mind Flexers, Quote Boxes, and Solitaire Hangman. But I do have some complaints, which I’ll make now. One of the Bulls Eye puzzles calls for a word that can be formed from the first letters of a sequence of words in the instructions, but the instructions are apparently not the same ones this puzzle was originally printed with, so that clue is impossible. One of the Hangman sets is composed of highly unusual words, like “ouabain” and “buprestid”, which is basically cheating. I remember playing Hangman as a child: the other children would say “Oh no, it’s Carl! He has a large vocabulary, and will doubtless choose an obscure word none of us know!” But I recognized even then that this would be a cheap victory. The true triumph is in choosing a word that’s perfectly common, but that they still wouldn’t guess, like “shoebox”. And that’s what most of the Solitaire Hangman sets are like, apart from this one. I can’t say that it was completely impossible, though, because I managed to get the word “siphuncle” right, despite not knowing it, just from guessing likely letters. The twelve most frequent letters in the English language are ETAOINSHRDLU, and applying those to “siphuncle” yields SI_HUN_LE with only five wrong guesses. And of the remaining letters of the alphabet, the ones most likely to appear before an H are C and P — which just happen to be the letters we need in the word. And finally, there’s a certain amount of repetition. Two of the Quote Boxes sets use the same Elizabeth Taylor quote about people with no vices. Even worse, Hangman set 6 is simply a repeat of set 5 in a different order. I can believe that they’re just copying stuff from the magazine, and that the magazine repeated puzzles occasionally. But it’s definitely something that should have been caught before publication. Once again, I seem to have gotten stuck in a pattern of starting Battleships sets and not finishing them. It’s funny: when I finished the last of the Battleships in the first Games Interactive, my reaction was one of relief that I would never have to do this again, even though I knew there was an entire additional volume of the things waiting on the Stack. The Paint by Numbers sets may take a great deal longer than the Battleships, but I’m finding the Battleships far more onerous. I think this is because Paint By Numbers is marked by near-continual progress. It can get slow, but you’re always improving your knowledge of what’s in the grid. Whereas in Battleships, I can just plain get stuck. It makes me think there’s got to be some approach I haven’t discovered yet, some way of looking at the grid that simplifies the impenetrable. I do think I’m doing better than I did in the first game. If nothing else, I’m managing to check for mistakes before submitting my solutions pretty consistently. (The UI changes help here.) But the fact that I’m aiming for real solutions in the first place is pure stubbornness on my part, given how contemptible a production it is, and especially given that I’ve already cheated. Finishing this game obviously means solving the Final Puzzle, and, lest we forget, you don’t actually have to solve any other puzzles to do that. You just have to attempt them. Actually getting them right is effectively a side quest. But if I were the sort of person who’s willing to just skip over the content to get to the end, I probably wouldn’t be writing this blog. Look: It bothers me that I cheated my way past the final boss in the South Park FPS. I recently got a bunch of Sonic the Hedgehog games in a Humble Bundle, and I’ve been contemplating putting Sonic CD back onto the Stack. That’s is a game I played before starting this blog — at the time, it was the only Sonic game for PC. I played through every level and reached an ending, but it wasn’t the good ending, and I’m thinking lately that it shouldn’t count. I have similar twinges about my suboptimal completion of Police Quest 3. So I have good reason to believe that if I don’t do my best to complete Games Interactive 2 for real, it’s just going to haunt me later.